SADDAM HUSSEIN DIE LIAO LARH! Thats right. Saddam is gonna die. After killing 148 people, another one is gonna die. Don't know why but i feel a bit sad. ( Don't ask me to CHANGE my feelings, only maybe ask me to change what i type. ) So are his half brother and Iraq's former chief judge gonna die with him too, that one i don't feel sad since previously i don't even know they existed. The former vice president got life in jail. 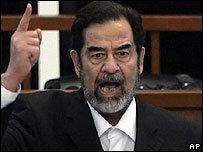 However, Saddam shouted "Allahu Akbar!" (God is Great) and "Long live Iraq! Long live the Iraqi people! Down with the traitors!" as the judge began reading his sentence. This could prove that he still care about the future or Iraq. A possible reason why he was still able to smile after sentenced to death could be due to the fact that he believed he made a sentence which would spread worldwide( which it did ) to send the message to the people of Iraq to be not controlled by others and to defeat all Iraq traitors. The Bush administration ( with respect and ... dunno ) comes again. People are dissatisfied with the interference of the US with IRAQ'S problem. I don't understand why... ... but any problem by any country, The US seems to come in, perhaps thats just my imagination. Below is a quote from BBC.com. Before the sentencing session began, former US Attorney General Ramsey Clark was ejected from the courtroom after handing the judge a note in which he called the trial a "travesty". US President George W Bush's Republican Party is at risk of losing control of Congress, in part because of voter dissatisfaction over its handling of the Iraq conflict. Now now, what could be the note??? Bribery? Facts? huh??? Why would he want to pass a note to the judge, and how come after the note was read by the judge, Saddam was sentenced death??? There are much dissatisfaction among the people about this, and hopefully US can tell everyone what exactly was written in the note. saddam is not going to die. i think. its another ploy.